For twelve years now, Claire McCaskill has waged war on the Second Amendment and gun owners here in Missouri. From backing Obama’s attempts to subjugate our gun rights to the whims of 3rd world dictators via the U.N. Small Arms Treaty, to pushing for Diane Feinstein’s ban on AR-15’s — Claire McCaskill has always fought against our gun rights! 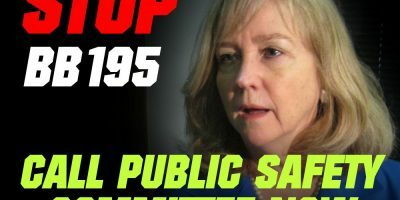 But now, as she travels across Missouri trying to convince gun owners to send her back to D.C. for another six years, McCaskill is doing all she can to conceal the truth about her record! That’s why the Missouri Firearms Coalition has produced the following ad, that we are unveiling today! Check it out below! As you just saw, Claire McCaskill didn’t just vote against your gun rights once or twice. Rather, Claire McCaskill has been a committed enemy to gun owners for over a decade! If Claire had her way, you’d be a felon for owning the ever-popular AR-15. If Claire had her way, you’d be a felon if you gave a family firearm to your grandson without government permission. If Claire had her way, you’d be a felon for owning a firearm under the age of 21, even if you’re a veteran! I am sure you agree that Claire McCaskill’s record on gun rights is outrageous. That’s why we have produced this ad, the first in a series that we will be unveiling. We need to get the word out, to make sure that as many gun owners as possible know the truth about what Claire McCaskill has done. But I need your help to make sure that this ad is seen by hundreds of thousands of gun owners right away. There’s no time to lose! As you read this, we are putting together a program to maximize the reach of this information using social media ads, radio spots, and TV ads — if we can fund them. How many ads do you want to fund? For $5,000, for example, I can place almost 100 radio ads on radio stations all over Missouri! Think of the reach that could have! For $2,500 I can run 6 minute-long prime time TV spots in major media markets! For $1,000 we can ensure that this ad is viewed by almost 100,000 people via social media advertising! For $500 MOFC can blend this ad between social media and radio, and have this ad viewed by approximately 45,000 people, and heard by tens of thousands more! For $250 we can email this ad out to an extra 25,000 people, giving them the ad plus all of the supporting documentation. The impact that you could have in deciding if Missouri will have a pro-gun Senator or not is limited only by how much you want to get involved! Now I know that the amounts listed above are a lot. Some of you reading this can do that, and more, and I hope that you will right away so we can begin to expose Claire NOW! For others, I know that these amounts just are not possible. But consider, for just $100, MOFC can blast this ad out to over 1,000 Missourians. And that’s not counting how many extra people see this ad, as those 1,000 people share the ad on their own Facebook page. Even $50 or $25 will allow us to broadcast this ad far and wide! The point is that we need your help, and we need it now. Whatever amount you can contribute will be put to this program right away. You can have a direct say in this process, by helping us get this ad out there! Don’t forget about the implications of this race, as it’s about more than just Missouri. For President Trump to have any chance of passing pro-gun legislation in D.C., he needs a pro-gun Senate. Frankly, he doesn’t have it, with several in the Republican conference being open supporters of gun control. This is our chance to augment the Senate with another pro-gun member, again, giving President Trump the ability to actually enact solid, pro-gun legislation! So again, please get directly into this fight by funding as much of our program as you can. This is our chance to push back against the gun control machine that is on the warpath right now here in Missouri, and nationwide! P.S. 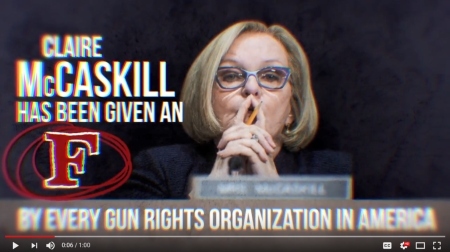 With the election less than two months away, the Missouri Firearms Coalition just unveiled this ad that highlights Claire McCaskill’s 12-year war against the Second Amendment! Once you’ve watched it, please help us make sure that we can get this ad seen by hundreds of thousands of Missourians by social media, radio ads, and TV ads!